The company says it's still not sure what QHP enrollee claims will look like. Aetna Inc. believes it should qualify for $50 million in federal reinsurance benefits, based on actual individual health insurance claims submitted during the first half of the year. Executives from Aetna (NYSE:AET) talked about the new Patient Protection and Affordable Care Act (PPACA) reinsurance program and other PPACA programs today during a conference call with securities analysts. Aetna held the call to review second-quarter earnings. The company is reporting $549 million in net income for the quarter on $15 billion in revenue, up from $536 million in net income on $12 billion in revenue for the comparable quarter in 2013. The company ended the quarter providing or administering coverage for 23 million people, up from 22 million people a year earlier. The company has been selling qualified health plan (QHP) coverage through the exchanges in 17 states. It hopes to start selling QHPs through the exchange in Georgia in 2015. Executives said only about 2 percent of Aetna’s health plan enrollees have QHP coverage from an exchange, but analysts pressed the executives for any ideas they might have about how the QHPs will really work. The executives said they might have a better idea three months from now, after the end of the third quarter. Aetna started the year with about 600,000 holders of traditional individual and family commercial coverage. The company had 230,000 exchange QHP enrollees at the end of the first quarter. The company added 360,000 QHP enrollees in the second quarter and now has about 600,000 QHP enrollees. They expect attrition to leave it with about 500,000 QHP enrollees at the end of the year. Three months ago, Aetna executives were estimating the company would end the year with 450,000 QHP enrollees. All non-grandfathered policies, both inside and outside the PPACA exchange system, are eligible for benefits from the PPACA reinsurance program. The program is supposed to reimburse a company for 80 percent of the eligible claims paid above a $45,000 attachment point and below a $250,000 cap. Aetna did not release figures for total individual policy enrollment, or total PPACA-compliant individual policy enrollment, but the figures published imply that it has between 600,000 and 1 million individual coverage holders. Qualifying for $50 million in reinsurance program payments means that Aetna had between 300 and 1,200 insureds with enough known claims to reach the $45,000 attachment point. The U.S. Department of Health and Human Services (HHS) is charging Aetna and other insurers and self-insured plan sponsors $63 per enrollee per year for the reinsurance program. Aetna will pay a total of about $600 million in fees for the reinsurance program for the first half of the year. All of Aetna’s non-grandfathered individual and small-group plans are eligible for the PPACA risk-adjustment program, which is supposed to use cash from plans with relatively low-risk enrollees to compensate plans with relatively high-risk plans. The QHPs that Aetna sold through the PPACA exchange system are eligible for a third program — the PPACA risk corridor program. The risk corridor program is supposed to use cash from health insurers with good underwriting results to help QHP issuers with weak operating results. Aetna does not yet have any thoughts on what it might get from, or pay for, the risk corridor and risk adjustment programs, executives said. 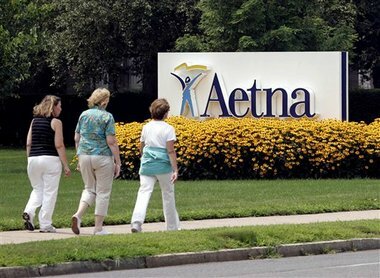 Aetna President Mark Bertolini said the company believes small employers will move away from offering health benefits. The percentage of small employers offering health benefits has fallen to 42 percent this year, from 44 percent last year, but that represents a continuation of a long-term trend, he said. He said his company sees no sign that the arrival of the PPACA exchange system and PPACA commercial insurance rules has accelerated the shift or led to many small employers dumping workers into the exchange system. He also sees no evidence that competitors are making heroic efforts to hang on to small-group business. “We see very rational pricing,” Bertolini said. Some health insurance market watchers have suggested that small employers will escape PPACA rules by self-insuring. Bertolini said he thinks small employers are more likely to cope with economic pressure by using private exchange programs than by self-insuring.